Your scribe always enjoys the challenge of judging over three main events this endurance culinary test for eleven talented chefs each coming off just winning their own city competition for Canada’s Great Kitchen Party (greatkitchenparty.com). The first task was to shop and cook for several hundred guests on an extremely limited budget of just over $1/per guest with ingredients to match a mystery wine which turned out to be fruity good acidity 14.9 powerful finish 2016 Mission Hill Family Estate Vista’s Edge Cabernet Franc from East Oliver producing only 26 barrels under their Terroir Collection series spending 18 months in French oak (25% new). 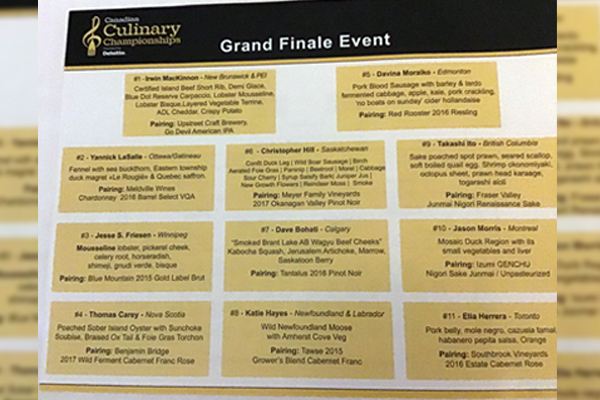 Chef Christopher Hill of The Taste Restaurant Group of Saskatoon led after this start in a close photo finish with a lovely artistic braised crispy pork belly confit in its own fat for 5 hours with a squid ink agnolotti stuffed with moist brandade of long cod. The second event is the most difficult challenging Black Box cooking a dish in 1 hour using compulsory all 7 items – this year all vegetarian: Saffron, Sweet Potato, Mushroom, Whole Grain Buckwheat, Sheep Milk 5% Yogurt, Whole Quince, and Sweet Chestnuts. The winner again in a close battle was Calgary Chef Dave Bohati of Murrieta’s who did the best job of utilizing the tough hard buckwheat element in a tuile wafer. 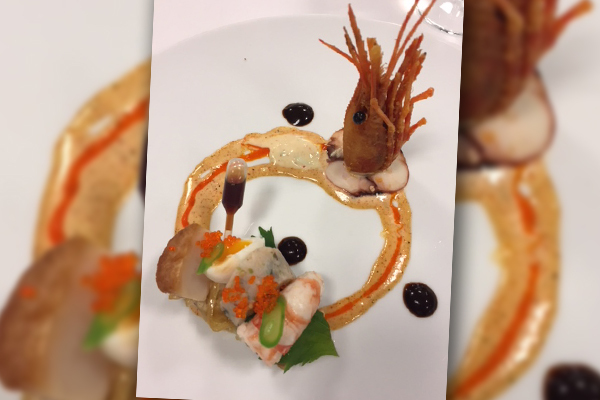 The third concluding Grand Finale on February 2, 2019 spotlighted some very outstanding and innovative cuisine including even aerated foie gras, reindeer moss, sea buckthorn, and shrimp okonomiyaki. Chef Takashi Ito from Aura Waterfront Restaurant in Victoria who stumbled to last place in the Black Box section with a thick undercooked dumpling bounced back to win this event with an amazing Sake poached spot prawn & seared scallops seafood winner. 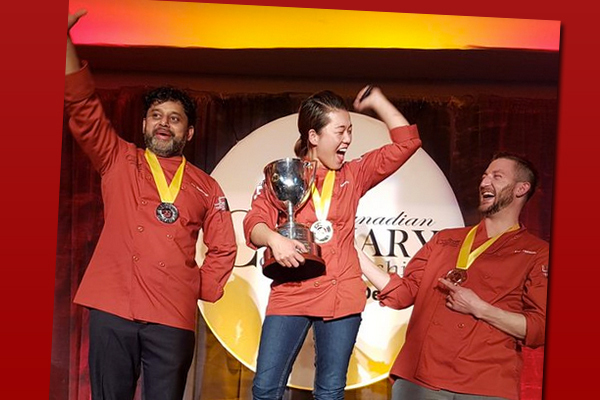 After the final voting marks from the triathlon were totalled the consistent Chef Yannick La Salle from Les Fougeres in Chelsea Quebec representing Ottawa/Gatineau prevailed with Chef Hill second and Chef Bohati third. Congrats to the three medalists plus all these participants for the very high quality of their preparations. Very well done indeed!